1. 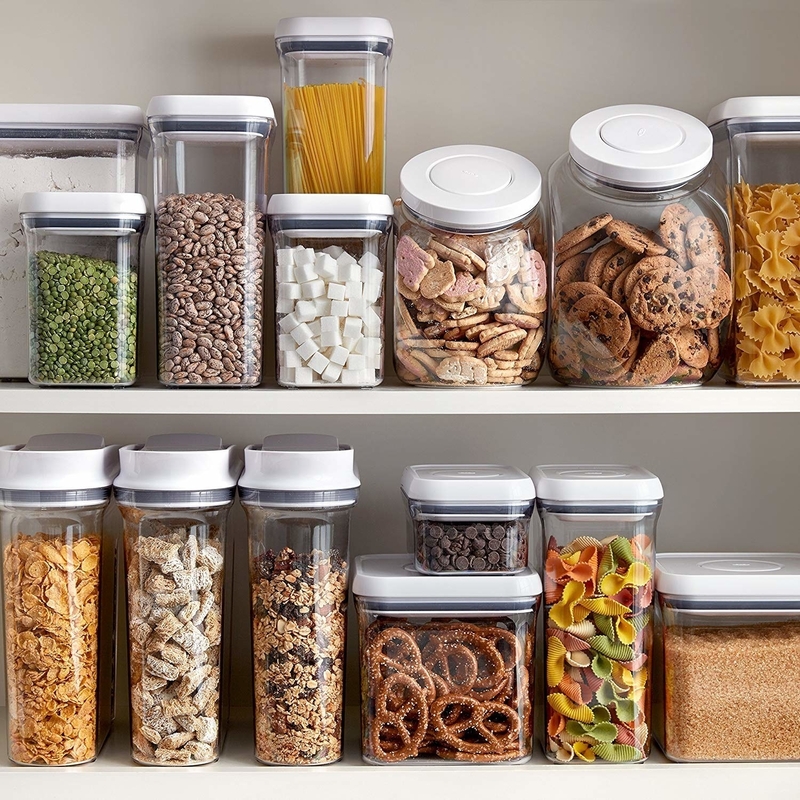 Decant pantry staples (rice, dry beans, chips, candy, cookies, etc) into airtight OXO pop containers because they keep things fresh for longer than the original packaging ever possibly could, all while making everything easy to find. They're designed to be incredibly efficient with the space on your shelves, the rounded corners make for easy pouring, and you press the button on top to open and seal the containers. Get the five-piece set on Amazon for $49.99. 2. Stack skillets and pans on an organizer rack to make it simple to grab the exact one you need without pulling three other pans out along with it. It also works well for baking sheets, cutting boards, and lids! And because it's made of a super durable steel, it can actually support the weight of cast-iron. Get it on Amazon for $8.87. 3. Transform the inside of one of your cabinet doors into an incredibly convenient ~seasoning station~ with these spice clips. Want to put these up in a rental? 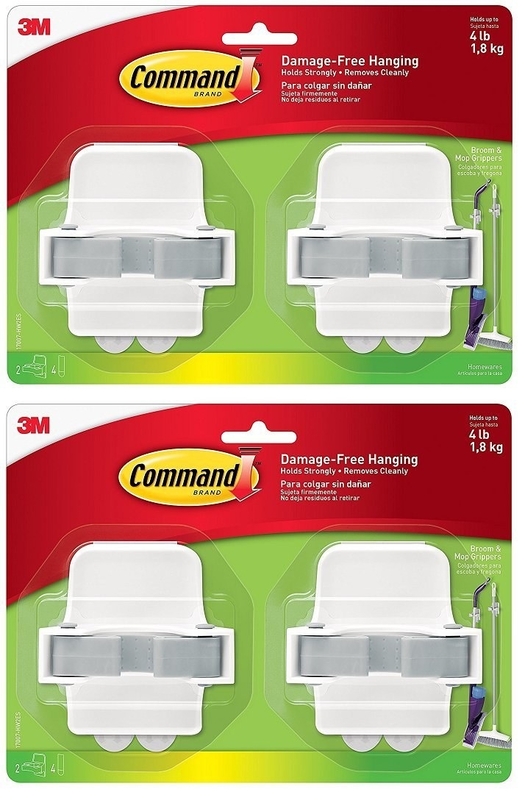 Secure them with the completely removable Command Picture-Hanging Strips instead of the included adhesive. Get a set of six strips (that hold 4 spices each) for $9.99. 4. 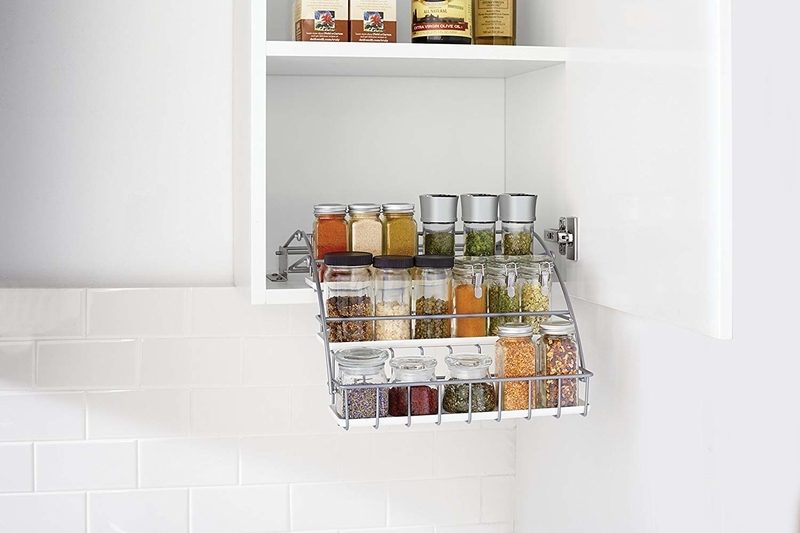 Or display your spices on a pull-down rack so all your go-to blends are always right at your fingertips. 5. Tame your plastic container cabinet with the help of a storage drawer: it literally brings everything in the back corner forward, where you can actually reach it. Which will make it easier to keep everything nice and neat! From Polished Habitat. 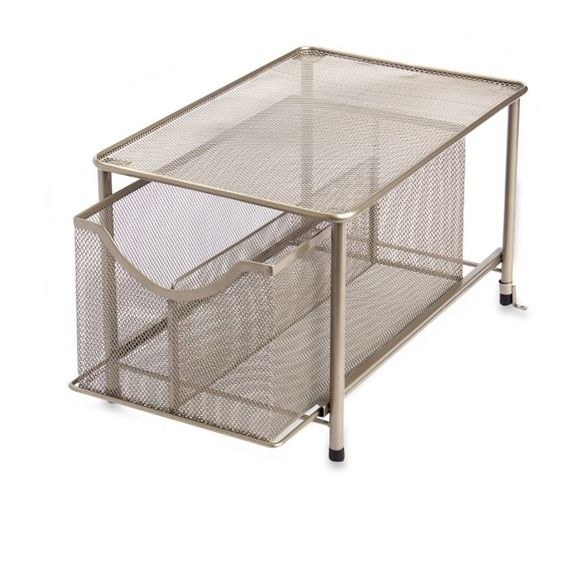 Get a similar drawer from Walmart for $22.22 (also available as a set of four in the same listing for $37.50). 6. Protect your knives from clanking up against each other (which ultimately just dulls them down) using a knife block specifically designed to organize drawers. This is one of those rare products with 4.8 stars — an incredibly high rating. It can fit up to 16 knives, and works even if you have a bunch of mismatched knives you've acquired over the years. 7. 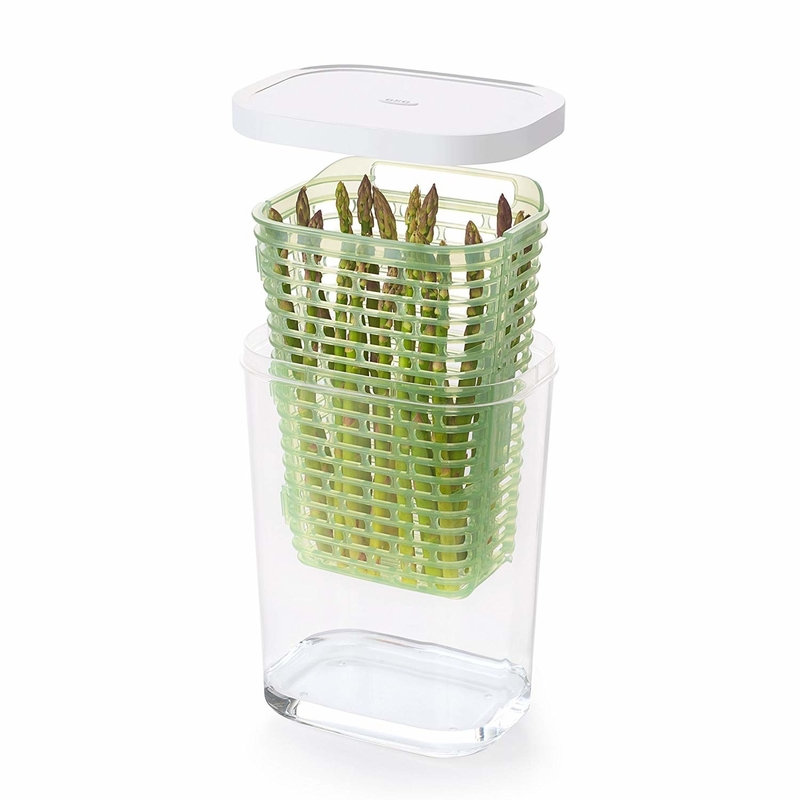 Extend the life of fruits and veggies with a produce saver that really does keep berries, bell peppers, spinach, lettuce, and more day-one fresh for nearly two weeks. I know these work because I've tried 'em, and have been using them almost every week for nearly a year now. 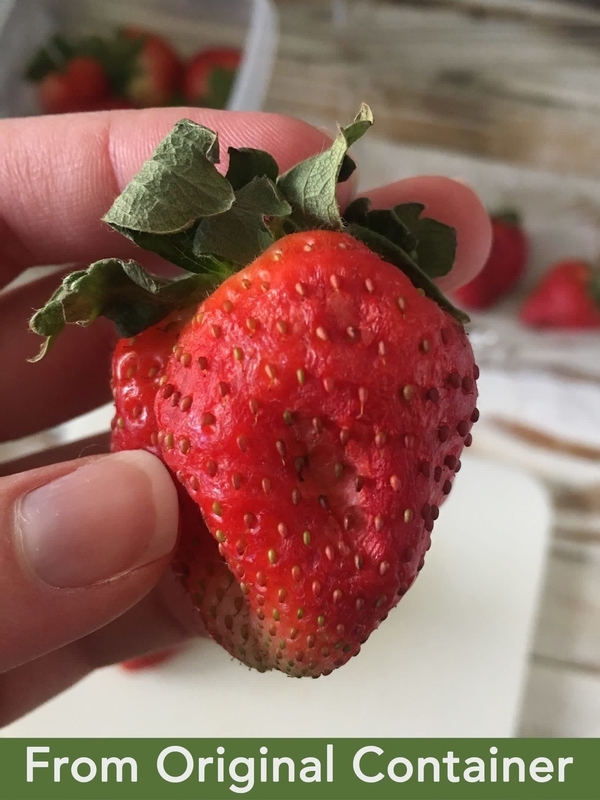 On March 5th (2018), I put half of my fresh strawberries in the medium-sized container and left the other half in the clamshell container they came in from the store. Then I checked them 10 days later, on March 15th (again, 2018) — and took these photos! Not that I wouldn't eat the dehydrated one, if that was my only option, but given the choice? 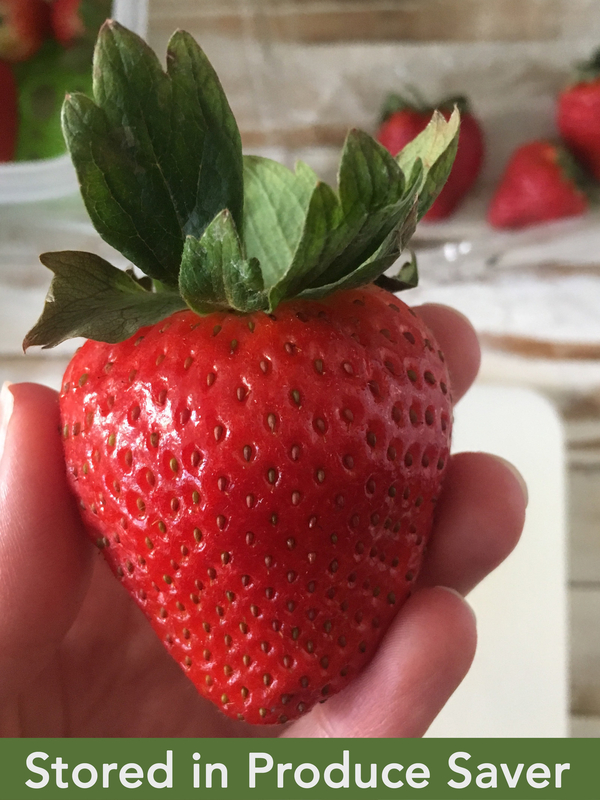 I'll take a fresh strawberry every day! They really, truly do work; have saved me SO much money over the past year; and are 100% top-rack dishwasher safe, to boot. You can read my full Rubbermaid Freshworks review for more! Get a pack of two big lettuce-sized containers and one medium strawberry-sized containers for $44.99 on Amazon; a single big container for $14.88 and a single medium-sized container for $10.98 at Walmart; or a pack with one large and one medium from Target for $19.99. 8. 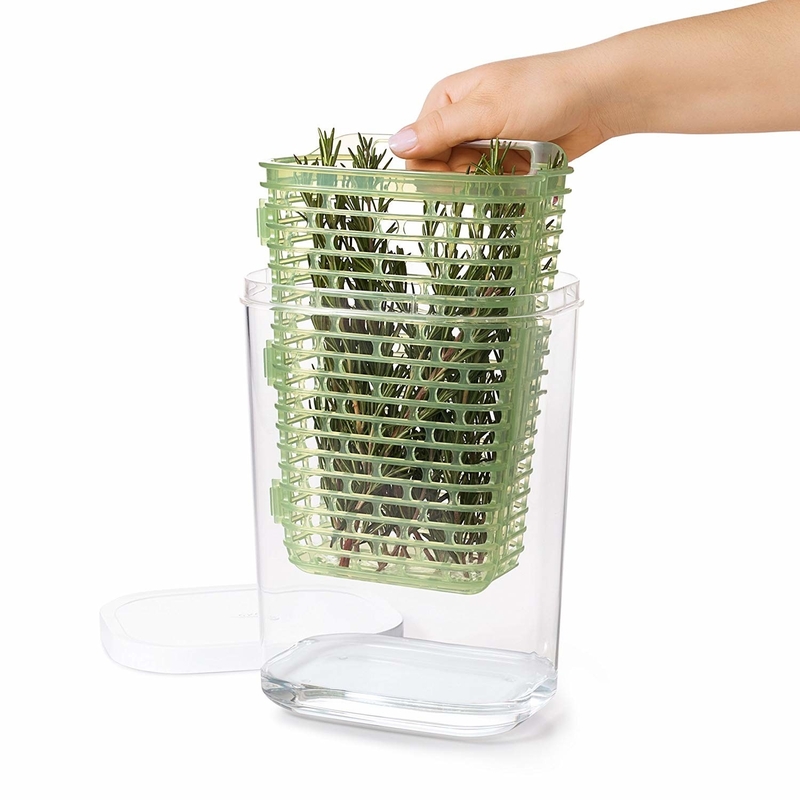 And stretch the amount of time you have to use fresh basil, cilantro, parsley, thyme, dill, rosemary, and more with an herb keeper. You simply add a small amount of water up to the line, then add your herbs! 9. Conceal your sponges, brushes, scrapers, and other miscellaneous dish-washing tools in a tip-out shelf made from those fake drawers right below your sink. Get it from The Home Depot for $17.55. 10. Or simply organize them with a corner tray that lets excess water drain away, instead of puddling up on your kitchen counter. Get it on Amazon for $10.99 (two colors). 11. 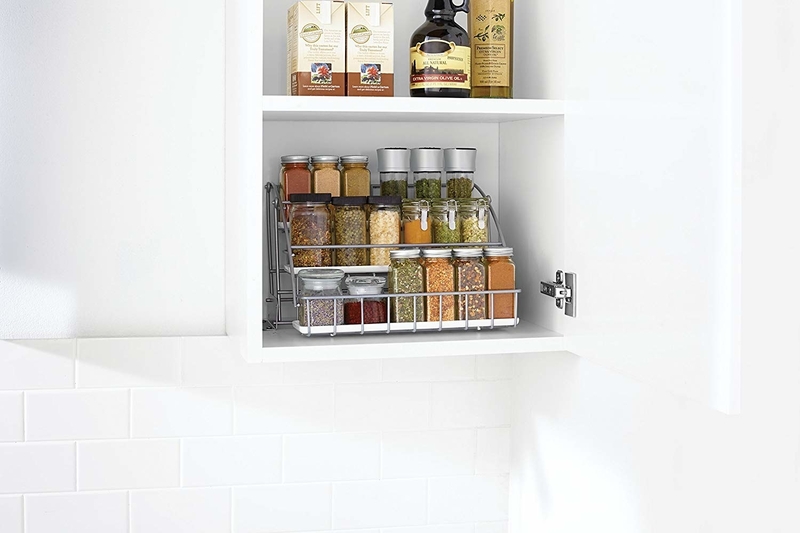 Maximize the vertical space in your dishes cabinet with an expanding shelf — you'll no longer have to pull down the stack of salad bowls just to get to the dinner plates. It expands from about 13 inches to just under 23 inches long. But of course, measure twice, order once! Get it on Amazon for $19.99 or a pack of two for $29.99 (about $15 each). 12. 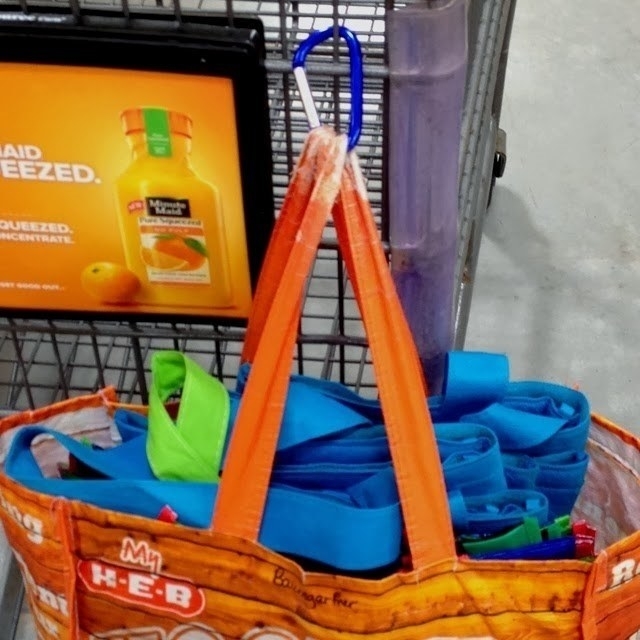 Stuff your reusable bags in one bag with a carabiner on it, so you can hook them both on your car and on your shopping cart. From Organizing Junkie and Organizing Made Fun. 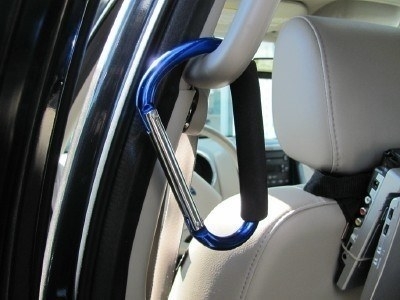 Get them from Amazon: a pack of two stroller hook carabiners (pictured left) for $8.99 or a pack of six regular carabiners (not for climbing; similar to what's pictured right; six colors) for $7.99. 13. And if you still keep plastic bags around, corral them in a cute fabric holder that fits right over your pantry doorknob, or hangs neatly on a removable adhesive hook just inside a cabinet door. 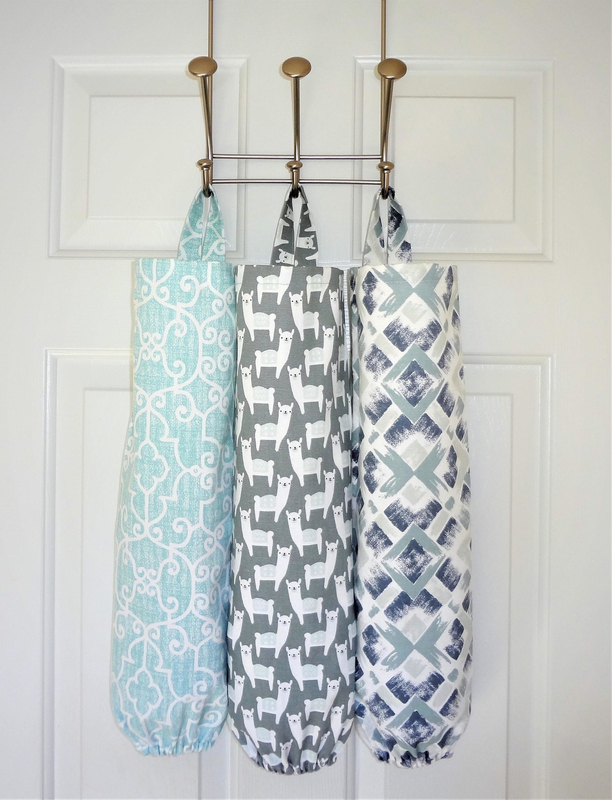 Get them from Sew Nice Designs on Etsy for $9.99 each in the arrow-vine prints (five colors) or the floral / llama / geometric prints. 14. Transform your linen closet (or drawer) by storing each of your sheet sets in one of their pillowcases. Photo by Raymond Hom. Courtesy of Martha Stewart Living. Copyright © 2011. 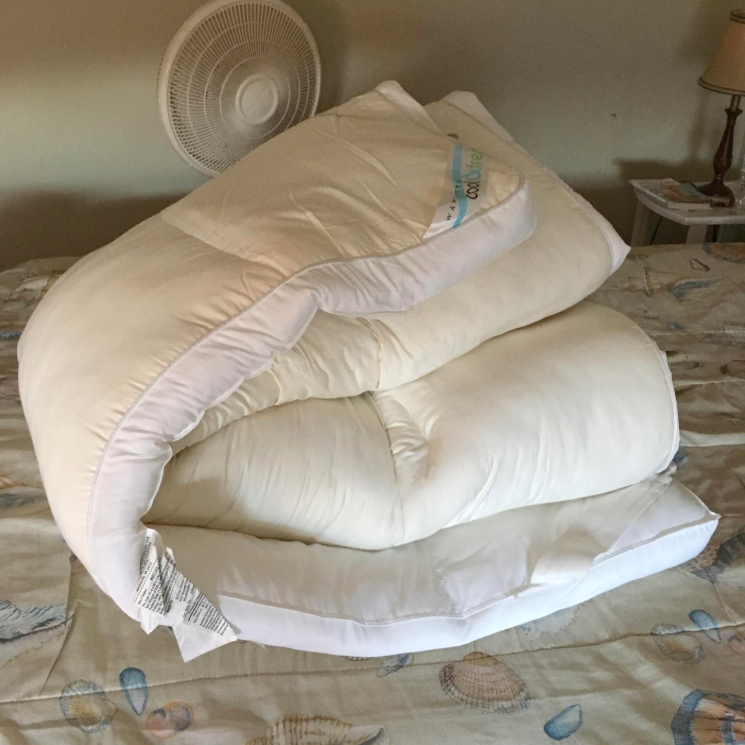 The pillowcases stack neatly, and you can easily grab everything you need for clean sheet day at once. Read more at Martha Stewart. 15. Enlist some Space Bags to collapse pillows and bulky seasonal bedspreads / duvets so they take up only a fraction of your storage space. You either vacuum out the air or use the included travel pump — it's super easy. And they come with screw-on caps to seal up the bags once you've deflated them, no worries about leaks later. Get a pack of six of their biggest "jumbo" bags on Amazon for $29.99. 16. 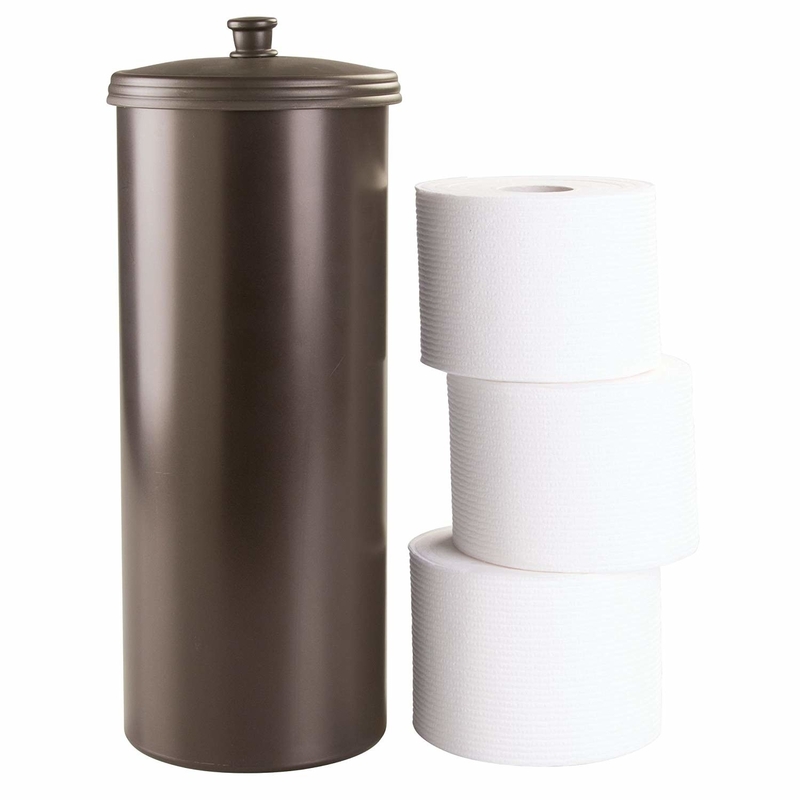 Don't have a spot under your sink for extra T.P., or have a bathroom so big that you can't reach a new roll when you need it? 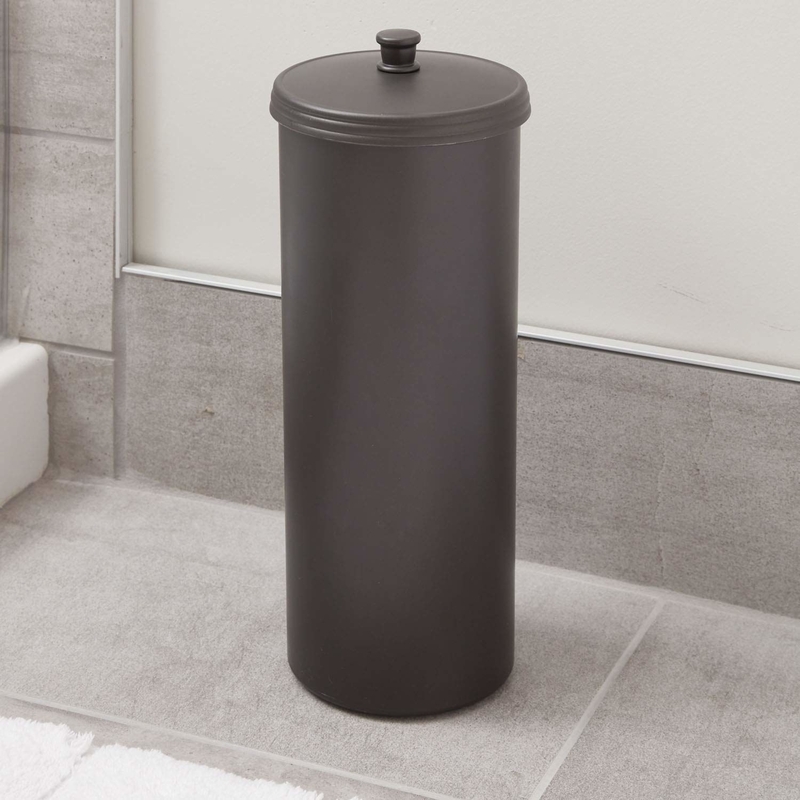 This toilet paper canister protects new rolls from unruly splashes while still keeping them within arm's length of the toilet. Get it on Amazon for $8.67. 17. Stash all your hair tools under your cabinet on a compact over-door holder that still leaves them super accessible. Get it on Amazon for $12.99 (seven metallic finishes available). 18. 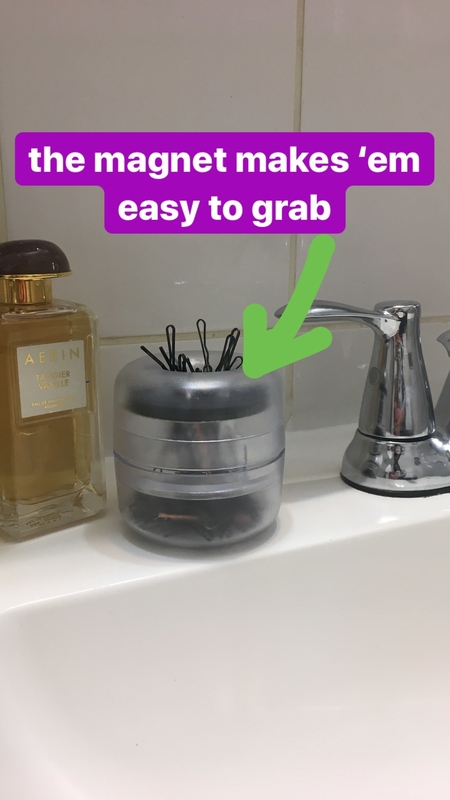 Grab another carabiner to lasso your hair ties so you can always find one when you need it, and repurpose a paperclip holder as a new home for all your bobby pins. I recommend this all the time because it's how I've been storing my hair ties for about a year now — and still have almost all of the original package, which is SUCH a rarity. I've been storing my bobby pins in a paperclip holder for longer than I can remember, and for all those years I've never even come close to running out of 'em. 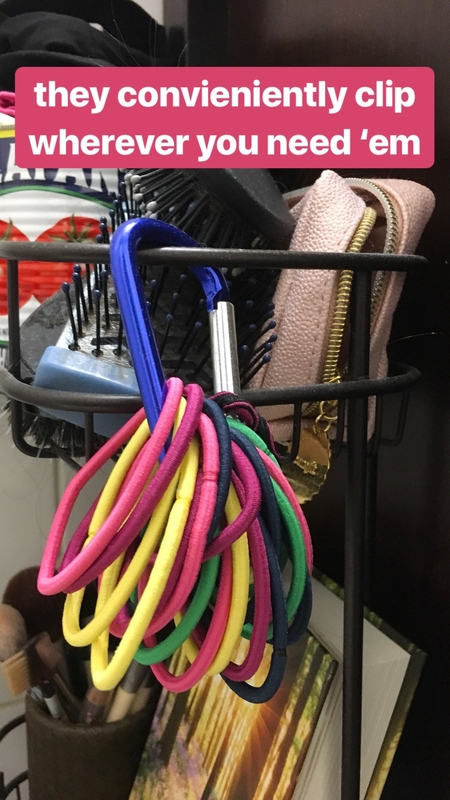 Get them on Amazon: a pack of six regular carabiners (not for climbing, six colors) for $7.99 and a similar paperclip organizer for $10.98. 19. File your entire nail polish collection away in a handled organizer that essentially lays all your color options out like a menu — you'll always be able to see exactly what you have. It holds 48 total bottles, 24 on each side, so you can always find the color you want with a single glance. Get one on Amazon for $24.99. 20. 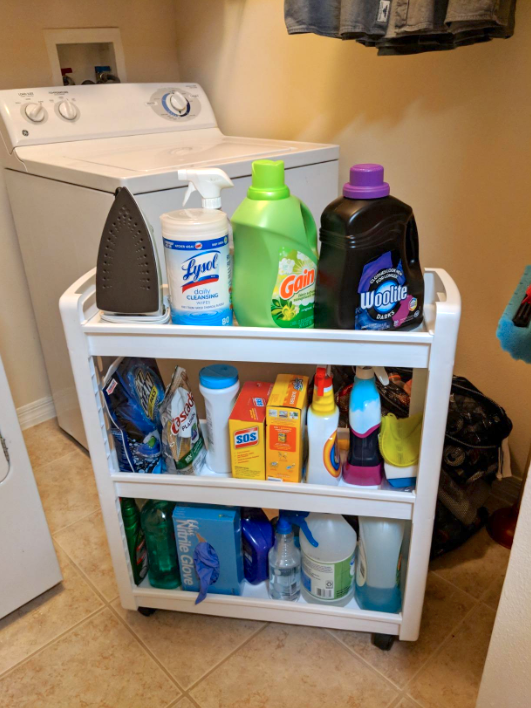 Sort through all the miscellaneous products that have slowly accumulated under your sink, then install a mesh drawer that's actually tall enough to hold most bottles. Get it from Bed Bath & Beyond for $22.99. 21. 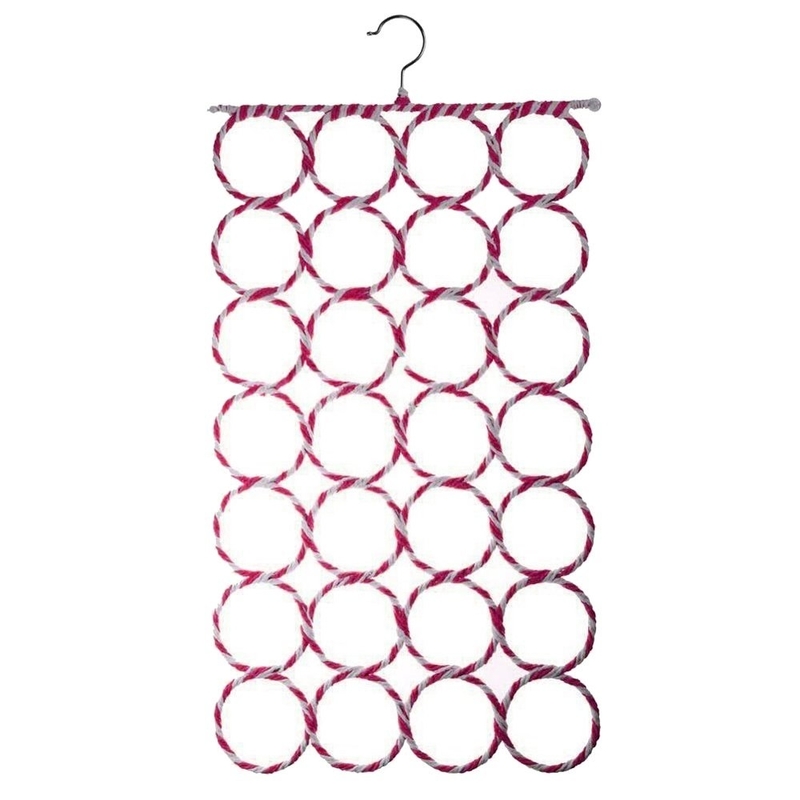 Capture bath toys in a mesh bag that hangs from a couple of suction cups, and everything will drip-dry overnight. Get the bag *and* four locking suction cup hooks on Amazon for $10.99. 22. Neatly display all your shoes on a four-tier rack that fits snugly beneath your closet rod — you'll never have to dig through a disorderly pile for the mate to your favorite sneaker ever again. 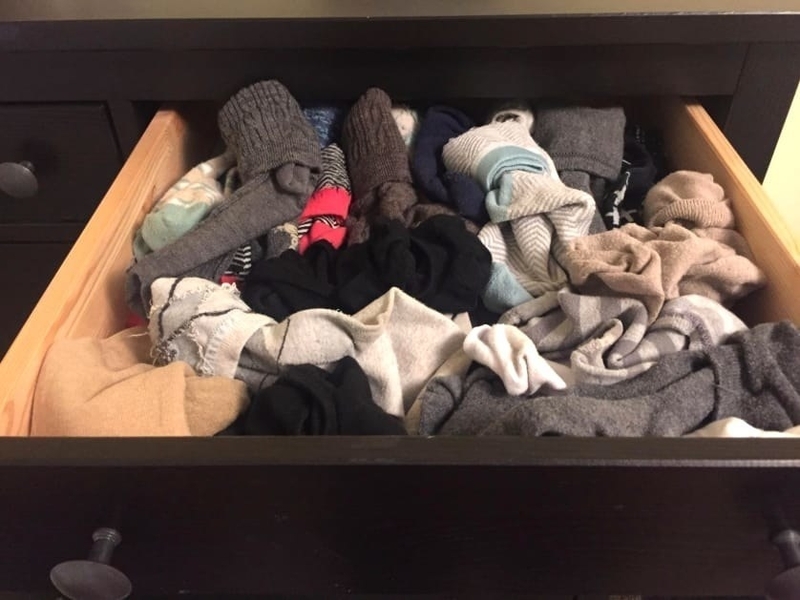 It holds up to 20 pairs of shoes, and many reviewers say it's true, unless you're trying to organize men's high-tops or any kind of high boot. Get it from Walmart for $18.66. 23. 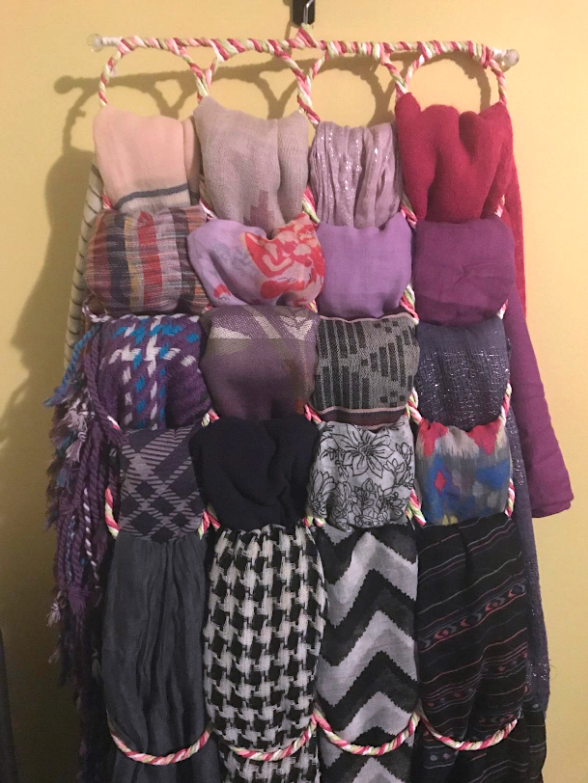 Layer your scarf collection on an organizer designed especially to make all your favorites easy to see and access without taking up too much closet space. 24. Divide up your drawers with this set of four organizers whose mantra is definitely "a place for everything, and everything in its place." Get the set on Amazon for $14.99 (five colors). 25. 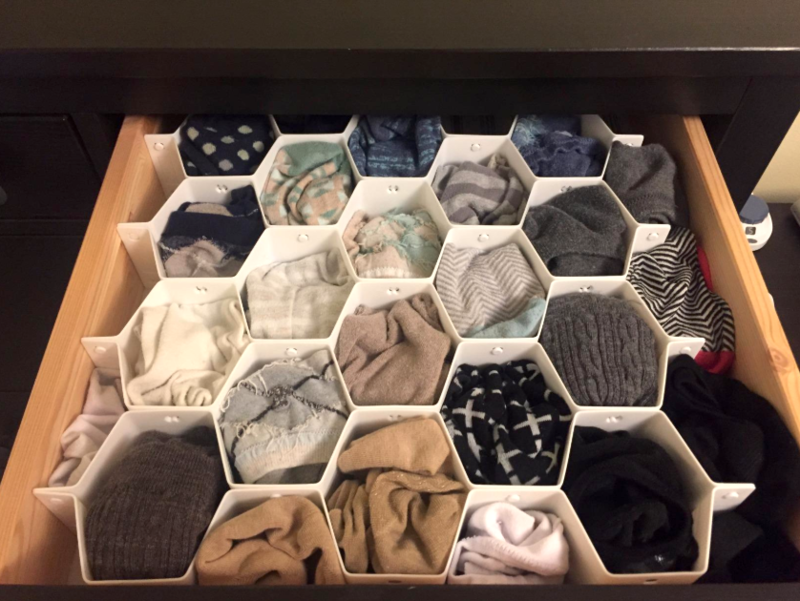 Or file your socks and underwear away in a honeycomb drawer sorter — it's so easy to just tuck each pair of in its little zone you won't be able to resist using it. Get them on Amazon for $10 each. 26. Display your favorite jewelry that you wear all the time on a simple wall-mounted organizer that you can hang up in your closet, on a door, or wherever works best in your space. This is another excellent candidate for the completely removable Command Picture-Hanging Strips, if you don't want to nail it to your walls. Get it from Love for County on Etsy for $45. 27. All your makeup, perfume, and brushes can be right at your fingertips with this countertop display — it makes everything look neat when all you have to do is kinda throw it all in there. Get it on Amazon for $21.99. 28. Or, if you prefer to keep your makeup in a drawer, give everything a designated spot with an expandable, compartmented tray. 29. Protect your seasonal clothes and shoes by stowing them under your bed in these divided bags. The fabric lets clothes breathe (preventing musty smells), and the clear windows let you know exactly what's inside. Get them on Amazon for $11.99 each. Want more? 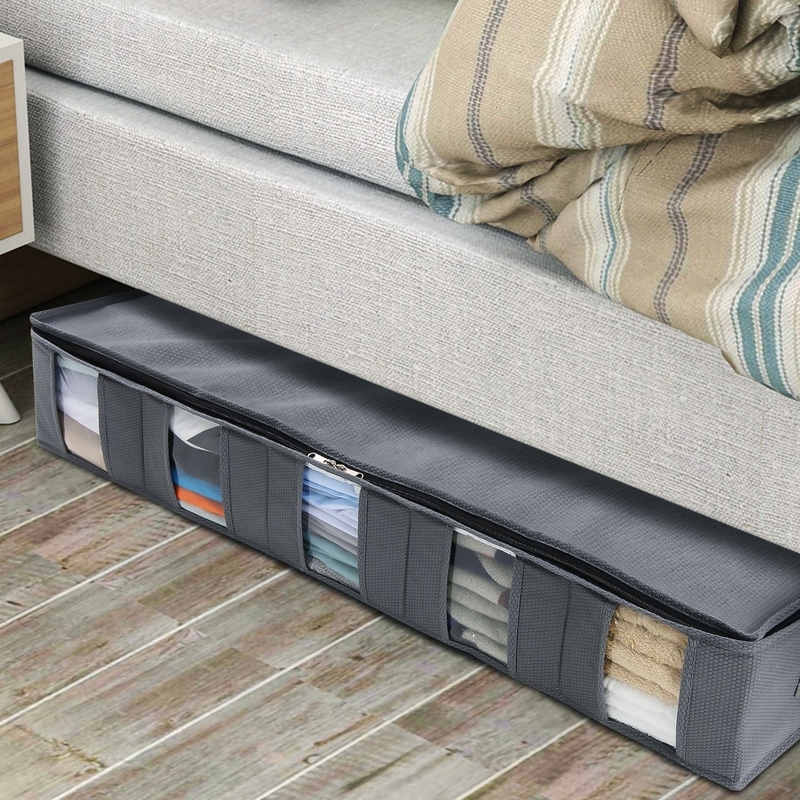 Here are 18 more smart under-bed organizers! 30. Hide some major extra storage on the back of almost any door with this adjustable, customizeable cabinet that mounts directly onto the hinges. To install, you simply close and lock your door, remove the hinge pins, line up the cabinet, then put the hinge pins back in! 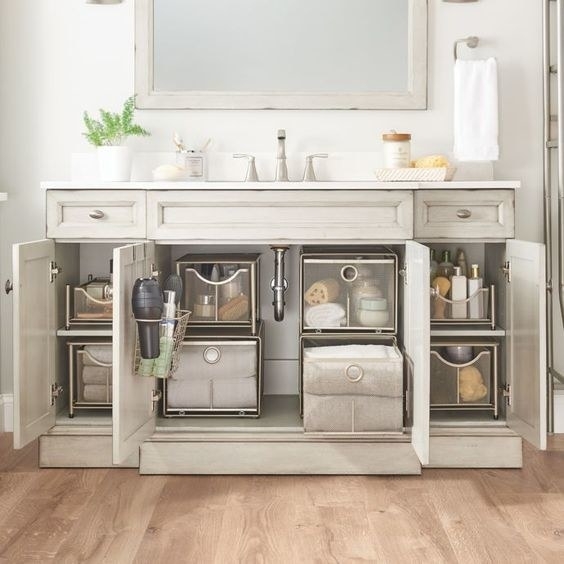 It comes with eight adjustable shelves, and can fit the contents of five medicine cabinets. You do need at least 3.5 inches between the hinge and the back wall for it to fit. 31. A cube organizer can both display and disguise all kinds of things — toys, game controllers and headsets, books, candles, you name it — all while serving as a handy entryway table, TV stand, clothes dresser, office cabinet...whatever you need most. Walmart has these in all sizes, shapes, and wood finishes, depending on what you need. This 4x2 unit can also be assembled vertically, if you prefer! Each cube is 12x12. Get it from Walmart for $85 (three finishes available). 32. Have an entertainment setup you already love? 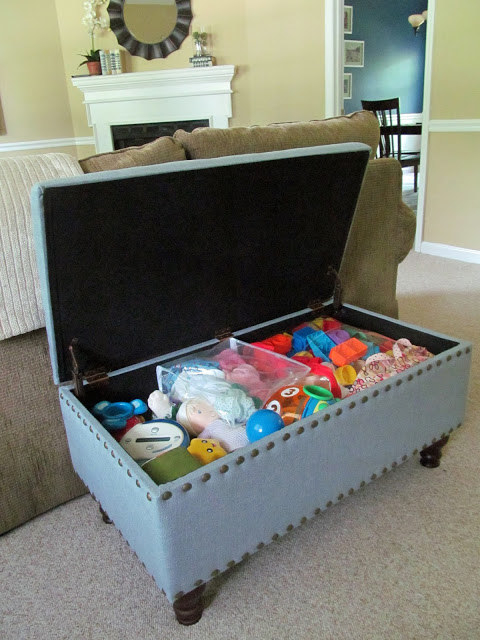 Quickly reclaim the living room as ~grown up space~ by hiding away all the random kid's toys in a storage ottoman. It can go behind your couch, along a wall, or work as a substitute coffee table. From Rooms by Melissa Boyer Interiors. 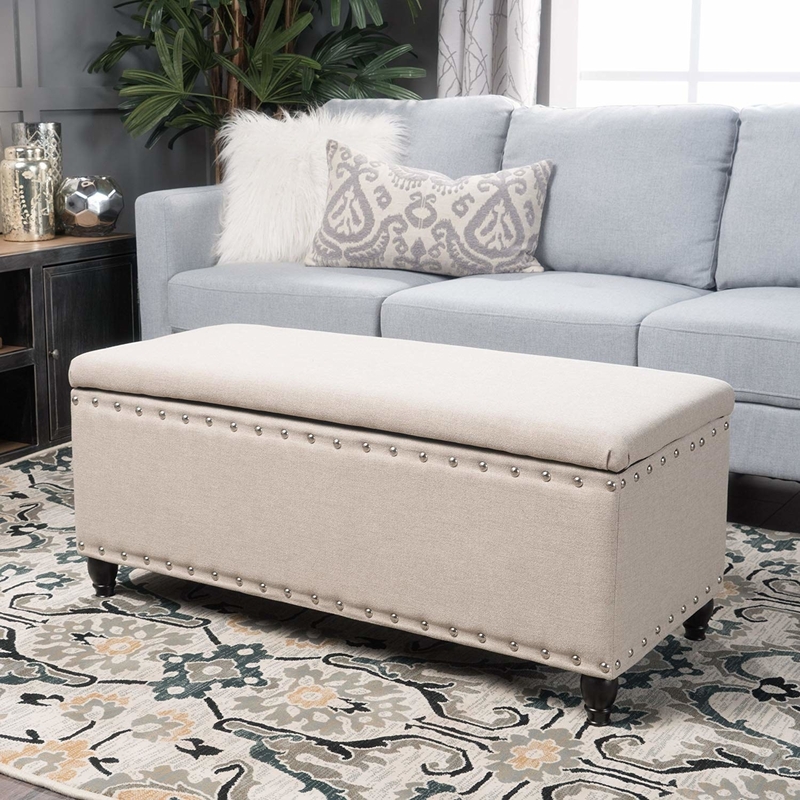 Get the bench-style ottoman pictured on the right on Amazon for $108.87. 33. And in the ~kids space~, this toddler-size storage shelf will make it easy for them to actually reach all their favorite toys — which just so happens to make clean up that much easier, too. The only way to make it better = if it somehow taught your kids to actually clean up without you asking, first! Get it on Amazon for $44.86+ (five colors/combinations). 34. Avoid the dreaded Legos on the floor thanks to the Swoop Bag, which contains the mess *and* brilliantly cleans it up with literally zero effort. Get it on Amazon for $52. For more, check out 30 other clever organizing ideas for kids stuff. 35. 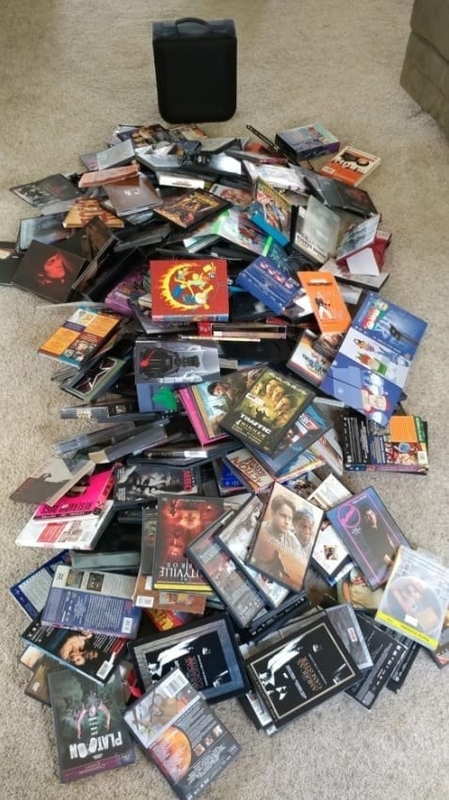 Reduce the shelf space all those plastic DVD cases take up to just 2.8 inches: get a disc keeper that'll protect all your favorite movies (and keep 'em in alphabetical order, if you so choose). 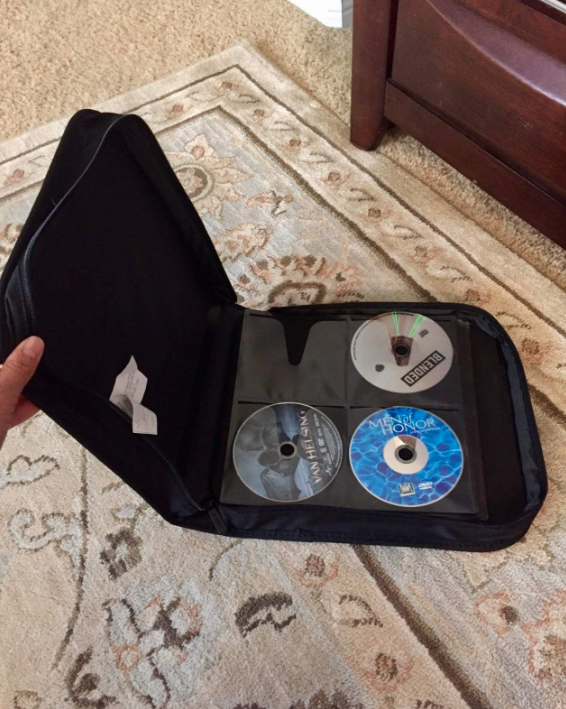 This also works well for CDs, if you still have 'em laying around — and still listen to them. Get the 128-capacity binder for $14 or a 400-capacity binder for $24.99, both on Amazon. 36. Any papers you want to keep long-term can look nice sitting on the bottom shelf in your office. Just file them away in these lidded boxes. Get one on Amazon for $24.49 (two colors). 37. 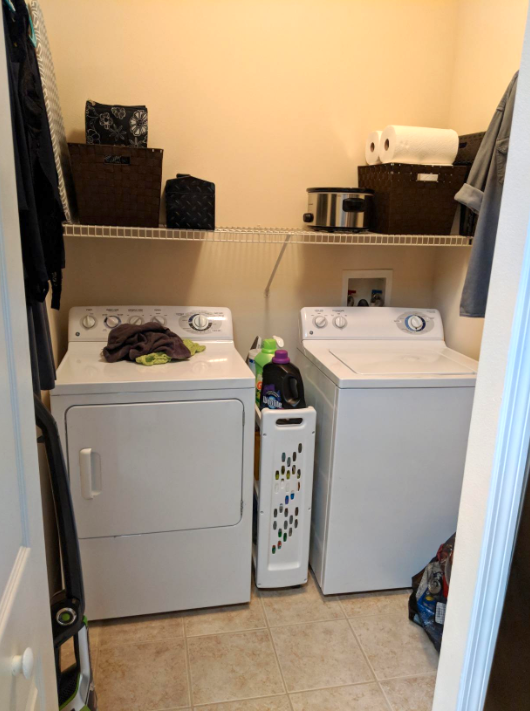 Sneak a little more storage space into that narrow gap between your washer and dryer — this narrow cart's sturdy enough to hold multiple bottles of heavy detergent. 38. 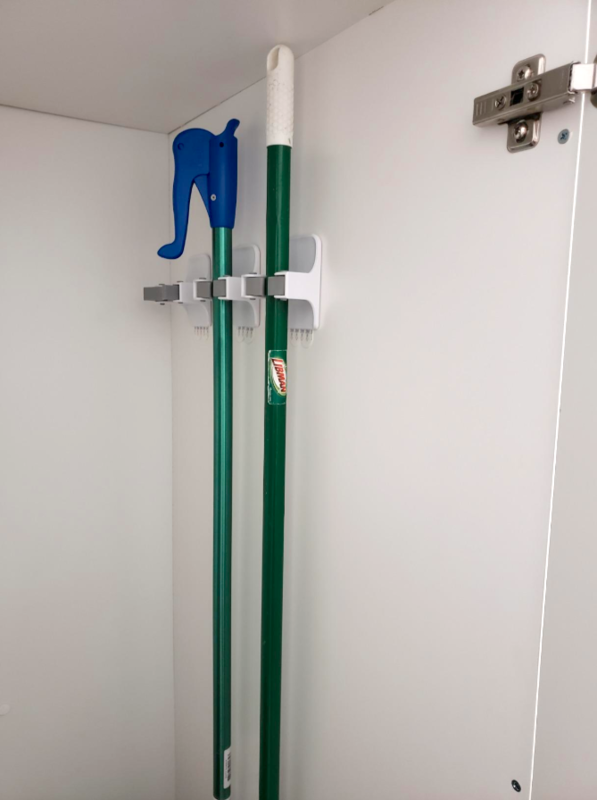 Mount your mops, brooms, and Swiffers on the wall using a genius organizer, and you won't have to battle the pile of cleaning products in the corner every time you want to sweep the floor. It can fit up to five different brooms/mops/etc, and has five extra little hooks perfect for things like dusters and dust pans. It also works for rakes and snow shovels! Get it on Amazon for $13.97. 39. 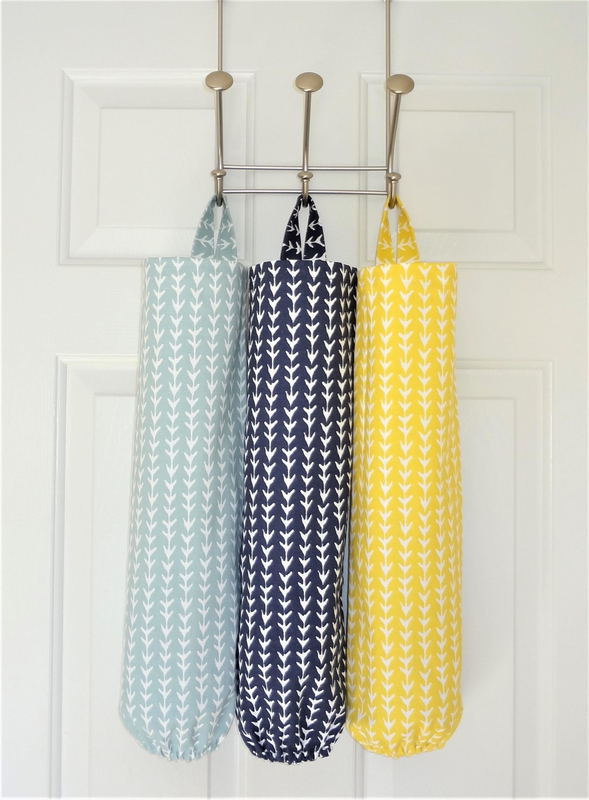 Or if you have just one or two items, want to put more space between each, or prefer something you don't have to nail into the wall, try a few Command Broom Grippers instead. Like all Command Strip products, you can easily remove these without damaging your walls or paint at all! Just be sure to follow the included directions for installing and taking them down. Get a pack of four on Amazon for $24.99. 41. Pick up a sturdy rack that'll gather all your golfing gear in one place and make it look darn good, too. Get it from Amazon for $69. 42. Assign a spot in the garage or basement for all the kids bikes, scooters, shopping carts, and toys. All you need is a roll of painter's tape! (That's $6.58 on Amazon). From I'm An Organizing Junkie. 43. 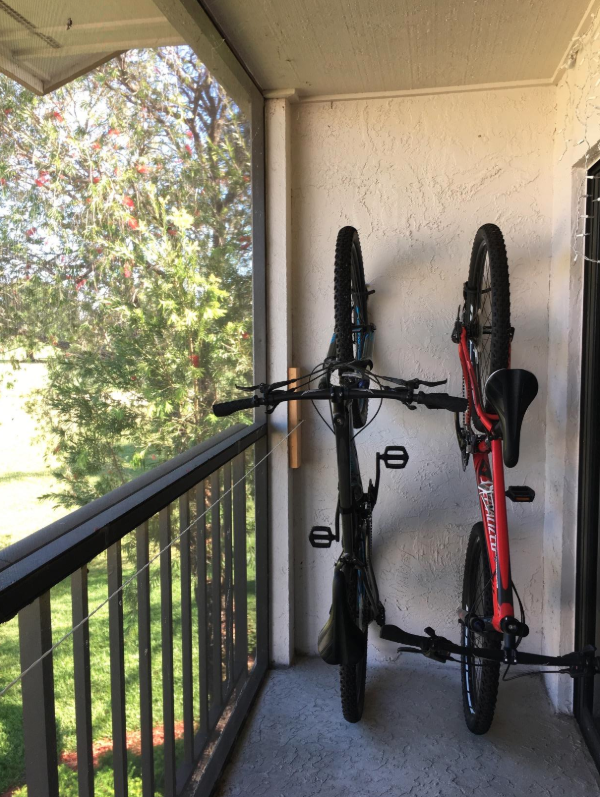 A simple wall hook can cut the square footage hogged by your bikes in half, wherever you happen to store 'em. Pretty much every reviewer agrees: these are excellent hooks, but you'll definitely want to use your own screws and wall anchors, not the ones included. 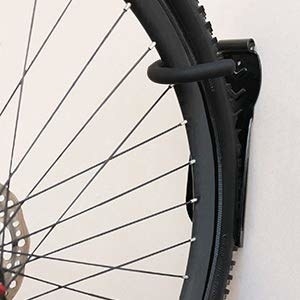 The hooks themselves are covered in rubber, so they won't scratch or damage your bike at all. Get a set of two on Amazon for $18.99. 44. Have a large collection of holiday wreaths? 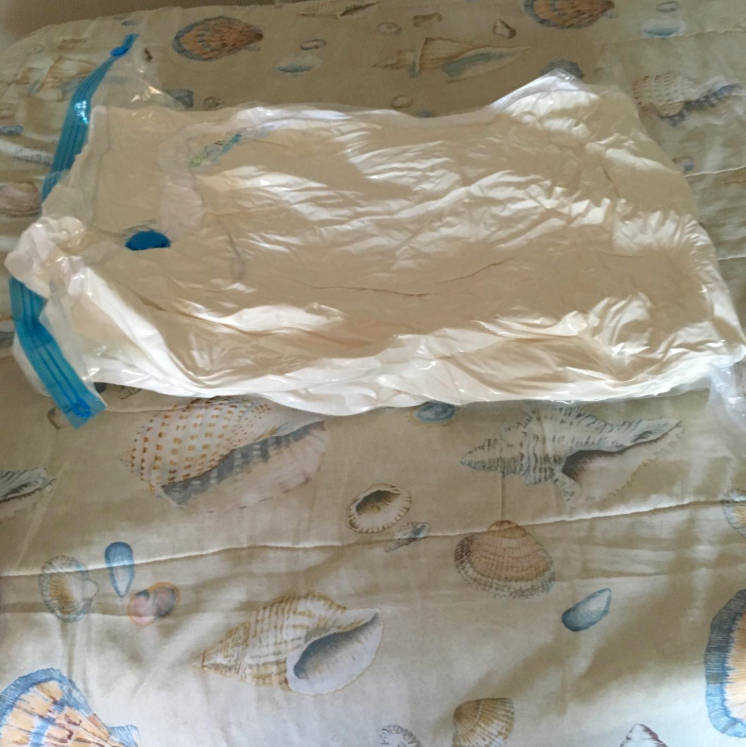 Protect them with drawstring garbage bags, then loop those over hangers to keep 'em off the floor. These are hanging from a wire shelf that was already in their garage; if you have a big enough spare closet, that could also work! From Organize Your Stuff Now. 45. And hang your birthday and seasonal wrapping paper where you can see your entire collection at a glance — just repurpose a clear garment bag. Genius! From The Chic Site. Get a pack of two garment bags on Amazon for $9.49. 46. Contain that dog-food smell in a wheeled container that also features an extra little bin for all your pup's most favorite-est treats. 47. While you'll (probably) never train them to put their toys away, you can find some relief from the dog toy clutter in any simple basket or bin that compliments your room's aesthetic. My parents do this with our poodles toys, and it definitely helps their living room and kitchen look neater! Get it on Amazon for $13.83.